On this day when it is so easy to feel self-righteous, perhaps more than other days, it is good to confess. Beloved, you have asked of me a very hard thing: unplug from the Internet long enough on Election Day to write this sermon and stand before you without checking the polls. I confess I hit “reload” as if up to the minute exit polls of undecided voters in the bell-weather districts of Lake County, Ohio will give me the confidence that only God ultimately provides. You have forced me to step away from the seduction of real-time updates passing as security. The Church father Tertullian says, “In vain do we flatter ourselves as to the necessities of human maintenance.” Do you feel it too? It is so hard to step out of that rushing stream of information. What we do tonight, that we choose to gather here, putting down our smart phones and picking up bread, setting aside our newspapers and standing to receive the cup, are alternate signs, a realignment of our lives away from the seduction of more news and returning to the Author of our salvation. I am grateful for this hard thing you have asked me to do. And since we’re on the topic, I ask for your forgiveness for taking the preacher’s prerogative and switching the Gospel reading tonight. Matthew inscribes the beatitudes into the “Sermon on the Mount” stretching over 109 verses. Luke writes the beatitudes into the “Sermon on the Plain” packed into only 30 verses- 4 statements of blessing, 4 statements of woe. To Matthew’s 2+ hours of Everett oration, Luke offers Lincoln’s Gettysburg address. And rather than repeat the sins of my ancestors, I decided to aim for brevity- you let me know if I can overcome my heredity. But the other reason to turn to Luke’s version this night is where it takes place- on the plain. Matthew’s version of the Beatitudes takes place on the mountaintop. But in Luke, Jesus “came down with them and stood on a level place, with a great crowd of his disciples and a great multitude of people from all Judea, Jerusalem, and the coast of Tyre and Sidon. They had come to hear him and to be healed of their diseases; and those who were troubled with unclean spirits were cured.” You can imagine the campaign rally version of this: The disciple handlers are trying to keep Jesus moving through the crowd, trying to avoid him getting stuck healing one person for too long. They’re trying to avoid ‘gotcha questions” from the Pharisees. The zealots James and John are heading out to the smaller towns acting as surrogates to drum up the crowds. The tired, smelly people have been waiting for hours in the New Hampshire cold just to see Jesus. The Roman guards are worried about the size of the growing crowd. Do we have enough Port-A-Potties? And the photo-ops! Let’s get a nice mix of diversity with some people from Judea and Jerusalem, Tyre and Sidon, but please, keep the crazy Syrophoenician outta the picture. And Judas has gone off message again… But it’s not quite like that. Instead, Jesus is healing all those who encounter him, all. It’s not a handpicked crowd of the beautiful and worthy with a non-threatening mix of ethnic diversity. It’s not a $10,000 a plate fundraiser with celebrities. No, Jesus’ rally is free and for all those needing healing. And he’s delivering a message that no man or woman seeking elected office in this country would ever give if they actually wanted to win. It is a scandal. Jesus begins by blessing the poor, a group of fellow residents that during this election were at best ignored and at worst demonized for sucking government resources as the ‘dependent class.’ Jesus blesses the poor. In Matthew’s version of the Beatitude, Jesus blesses the “poor in spirit;” in Luke, Jesus blesses the poor. It’s uncomfortable. It’s a lot easier to spiritualize Jesus’ message about the poor in spirit so as not to implicate our own comfort and riches. Matthew says Jesus blesses “those who hunger and thirst for righteousness.” Luke avoids domesticating Christ’s scandalous message and Jesus declares, “blessed are you who are hungry now, for you shall be filled.” In Christ, God declares a partisan commitment to the poor and the oppressed. It is absolutely valid to question whether in this country and economy, all stand on a level playing field. NFS Grundtvig, a Danish Lutheran pastor wrote “In Denmark, our hills our not high and our valleys are not low. So too our people … While there are people with more and people with less, no one has too much and no one has too little.” But we cannot debate, cannot question one another on legitimate difference of policy from the mountain tops. We have to come to a level place. Blessing and woe- all is to be changed, none are to stay the same in Luke. Yet again, a relationship with Christ flips the order of what is before us. This is not about guilt about what you have, but about all of us getting healed. In Luke’s beatitudes, Jesus is expressing a real and primary concern for the materially poor and hungry now. But he also invites all of us to come get healed. And we delude ourselves if we don’t think we are in need of healing too. But we’ve got to come down off of our mountains, off of our bully pulpits to a level place to be changed. We can stay on our mountain tops, shouting across the chasm of our country at one another, but we cannot be changed from there. We cannot be healed from there. Like that mess of clean and unclean people, we come down from our mountain tops to a level place to be healed. Jesus does not heal from a distance, but with hands touching broken bodies, fingers pressed on deaf ears, palms pressed on bent spines, hands lain on bodies wracked by death. For us to be healed, we have to walk down the mountains of our separation and be touched. You can’t taste and see that the Lord is good if you stay on your mountain. On the day when we are most divided, communion is Christ’s invitation to come to a level place. You know what that act of bi-partisan hospitality looks like? A family member of mine, who shall remain nameless, without power or heat for the past 7 days in New Jersey after SuperStorm Sandy- a family member, an ACLU card-carrying, pro-choosing, gay-marrying, public-educating, liberal Democrat is being housed this night in the home of staunch fiscal conservative Republicans… with power and a spare bedroom. You know this. You know this is possible. You know that we can rise up to become our better angels. You know it is possible to disagree without being disagreeable. Now, I most certainly have candidates I hope and even pray will win tonight, because I think they will support policies the least, the lost and the lowly. No one is asking you to give up your political convictions. The invitation is to re-member your primary identity at this table. “The English word ‘vote’ comes from the Latin ‘votum,’ meaning vow or wish.” We think of vows of marriage, vows at ordination, vows before God, but our vote, our vow today is also a promise, a covenant before God and God’s people to stay in community after Election Day. We vow to participate fully in this country, even when we disagree. We vow to name the nameless women and men who fought, were bruised and died for the right to vote. We vow to pray for our country, in the words of Lincoln “conceived in liberty, and dedicated to the proposition that all men are created equal.” What we do today is holy. What you do tonight is prophetic. It may not feel so, but it is. In 1938, a German Roman Catholic priest Fr. Max Metzger gathered Protestant and Roman Catholic clergy and laity together in Meitingen-bei-Augsburg to pray and study together. The Nazis considered these ecumenical gatherings subversive to their political agenda. Father Max was arrested, tortured and accused of being a spy. At his trial, he declared “I have offered my life for the peace of the world and the unity of Christ’s Church” and was executed at the Brandenburg prison on April 17, 1944. We are not in Hitler’s Germany by any stretch, but you are participating in that same witness of Fr. Metzger and the ecumenical saints in Selma, and all those nameless faithful throughout history who refused to be divided from other Christians and co-opted for political gain at the expense of their primary identity in Christ. . In a season when churches seem best known in our political life for our impressive skill in dividing, what you do tonight is powerful. And what you do tomorrow and next Sunday and every day after this election when, because of your faith, you choose to treat others like children of God rather than political enemies. But today, come to this level place, this table set for all. There is no receiving line for Republicans and a separate line for Democrats. There is no line for our Mileage Plus- Executive Class- Gold Star frequent fliers. There is no express check-out line for you with twelve sins or less to confess. No, at this table, there is no Jew or Greek, female or male, master or servant, Democrat or Republican, liberal or conservative. There is one table, one Church, one Christ. The people shout, “I follow Romney!” “I follow Obama!” “Is Christ divided? Was Romney crucified for you? Were you baptized I the name of Obama?” By no means, St Paul proclaims! You cannot buy a seat at this table, you cannot earn your way to grace. You cannot do anything to separate yourself from the love of Christ Jesus. This is the level place where all things bend towards the One loves us unconditionally. No matter how you voted, or if you voted, Christ welcomes you here. 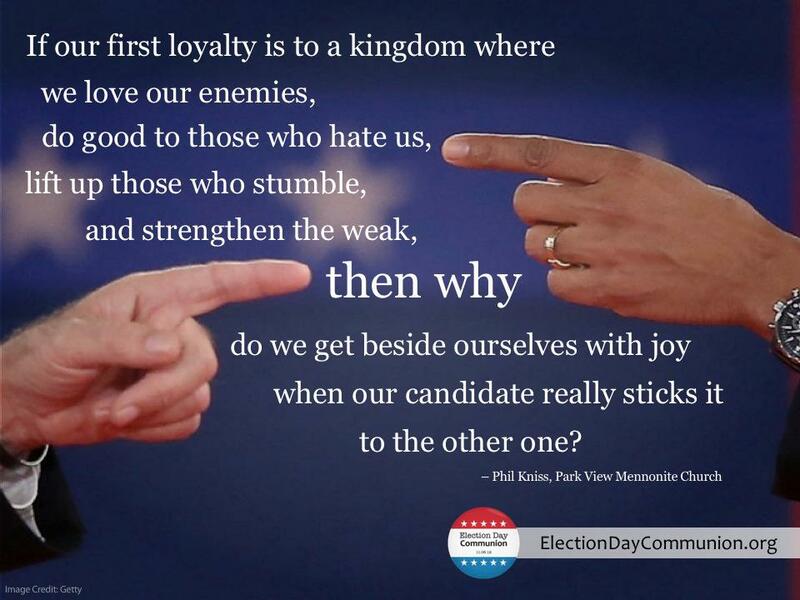 Our unity comes from our baptism in Christ, not the ballot box. All you need do is come down off your mountain, stand in this level place with these other messy, unclean people in need of healing too and eat.